Posted on 14, September 2016 by EuropaWire PR Editors | This entry was posted in Energy, Gas & Oil, Germany, Technology, United Kingdom and tagged E.ON, innovative battery solution, Karsten Wildberger, national grid. Bookmark the permalink. Düsseldorf, Germany, 14-Sep-2016 — /EuropaWire/ — E.ON has been awarded a contract with the British transmission system operator National Grid to support the power grid’s stability with an innovative battery solution. With the strong growth of weather-dependent renewable sources such as wind and solar, the amount of power fed into the grid is becoming increasingly volatile. National Grid had therefore launched a tender for a new service to deal with volatile fluctuations. 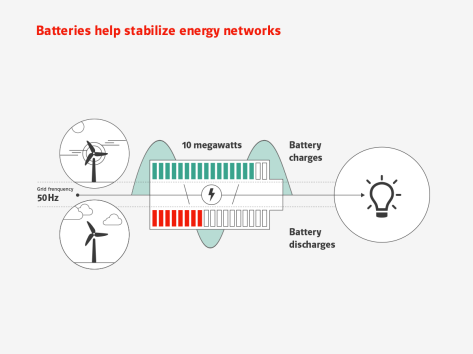 As one of the first of its kind in Great Britain, E.ON’s battery system will help balance demand and supply in real time ensuring that the power supply and quality is maintained. The solution makes it even possible to increase the share of renewable energy in the grid. The 10 megawatt (MW) lithium-ion battery with a size of four shipping containers has an equivalent power of roughly 100 family cars.